For staff returning to work after the festive season with a long wait until pay day, it’s no wonder that January is one of the worst months for low morale. It’s also the time when most people start to think about looking for new jobs. 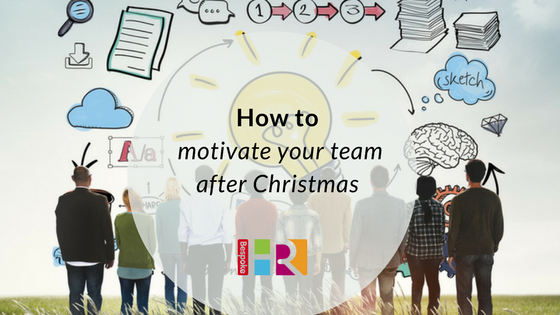 So how do you boost energy and motivate your team for the year ahead? Research shows that offering staff additional benefits can improve employee engagement, helps retain staff, boosts morale and ultimately positions your business ahead of the competition as a good employer. Check out our guidance on starting a scheme. This doesn’t have to be a formal appraisal meeting, but could be a one-to-one where you discuss aspirations for the year, talk through any potential issues and set some goals and targets so they have something to work towards. Alternatively, why not conduct a staff survey to ask your team about their hopes for 2019? It’s important to keep the upward and downward communication channels open in January, as this is when many people will start to think about looking for new jobs. We have a staff survey template you can use for free and email to your team. A simple lunch, or coffee morning in the office can boost morale by demonstrating that your business doesn’t just entertain staff at Christmas. If you schedule something for the end of January it will give the team something to look forward to, and keep a bit of the Christmas spirit going! The start of the year is the ideal time to map out training and where it is needed most. This will help staff to shape their personal development for the year ahead too. Read our guide on how to start a training scheme within your SME. ‘Bite-sized’ lunch and learn sessions throughout January can be a great way to get staff motivated whilst not overwhelming them. We have a free template which can be emailed out to your team. January is typically the time for new goals, and many staff will be returning to work with resolutions for the new year. Workplace wellbeing is becoming an increasingly important element of HR, so think about the ways in which you could enhance your office space – perhaps introduce free fruit once a week, invite a therapist in once a month for desk massages or offer staff gym membership as part of an employee benefits scheme. One of our clients ran a ‘January sales secret Santa’ which created a real buzz in the office towards the end of the month. For advice on motivating your team, or to discuss any other HR issues, call our team for 15 minutes of free HR advice.